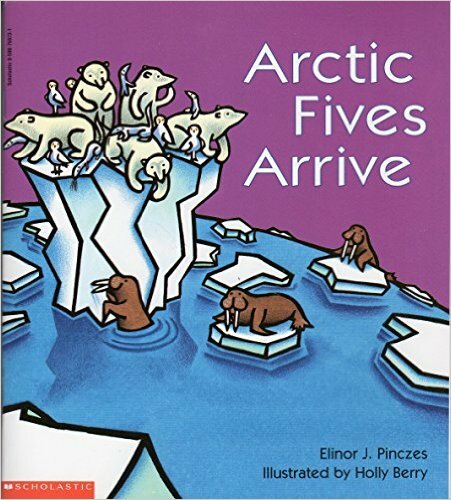 Elinor J. Pinczes's ‘Artic Fives Arrive’ (1996) is probably the lesser known story among all the titles in Elinor’s mathematical story collection. In brief, it is a story about six sets of five Arctic animals coming to see the Northern Lights. That’s pretty much it. When comparing ‘Artic Fives Arrive’ with the other four stories in the series (e.g. ‘One Hundred Hungry Ants’ and 'A Remainder of One’), it is arguably not as humorous or engaging, if at all. There isn’t much plot or story in it. The illustration style is somewhat dated and at times can be quite difficult for very young readers to spot, and hence count, all the animals on the pages. Moreover, in the context of mathematical stories, writing in rhymes can sometimes be distracting as the focus tend to shift from choosing the best age-appropriate words to clearly explain mathematical concepts or situations to simply just choosing words that rhyme. All in all, ‘Artic Fives Arrive’ can still be used to introduce the concept of skip counting, but might not be able to hold very young children’s attention for too long.